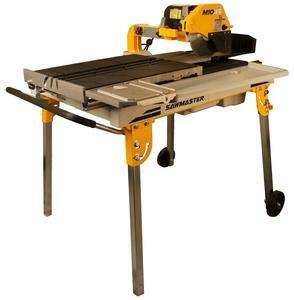 SawMaster is best known for its high performing tile saw and other top-quality tile cutter products. 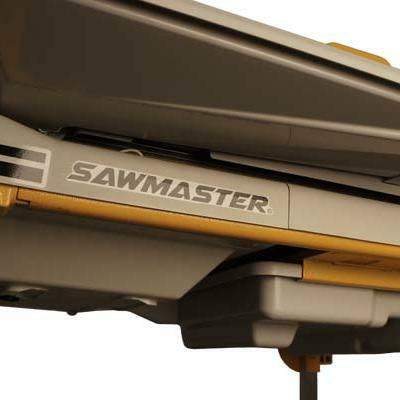 Popular among professionals in the industry, SawMaster tile saws are well known for their outstanding performance and abundance of features. 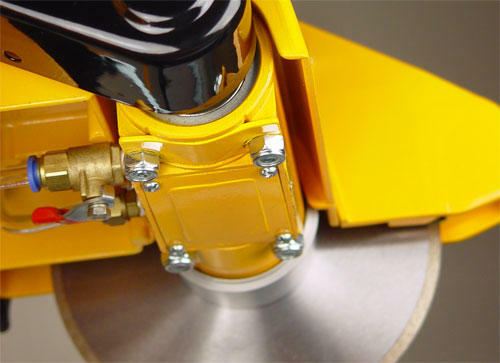 Although they are generally the smallest of SawMaster's saws, they provide more than ample power and cutting capacity to handle the most demanding ceramic-related jobs. 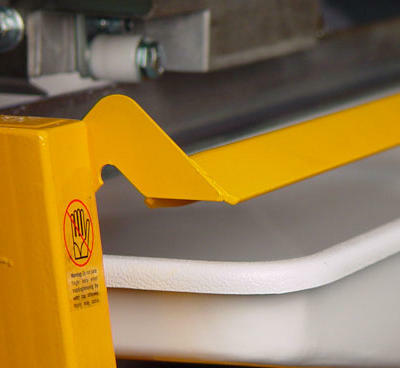 A variety of shapes, sizes, and functionalities are available to ensure that professionals have the choice of cutting platform that is most suitable for the intended use. 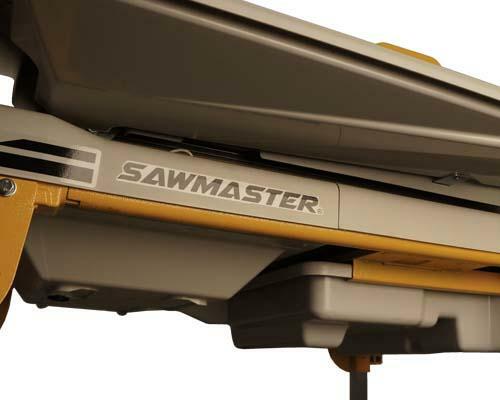 Whether you’re an independent contractor or homeowner, you can count on SawMaster to equip you with premium quality tile saws that are precisely engineered to neatly cut through a variety of tiles. 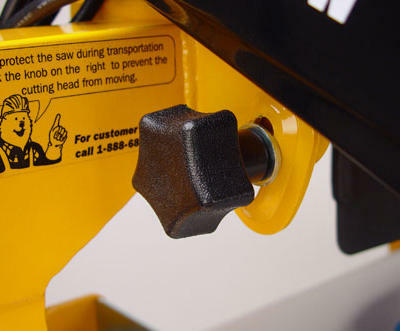 SawMaster strives to provide our customers with tools and products made with top quality materials held to the highest standard. 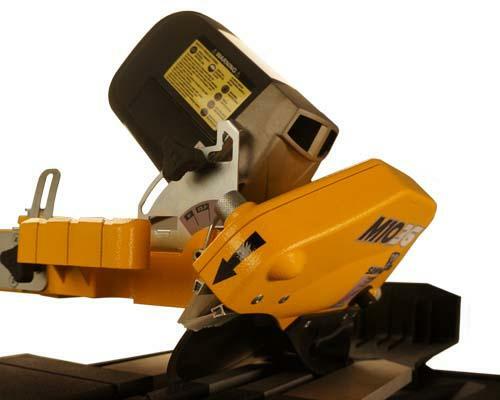 We ship our tile saws to a wide range of consumers residing in the United States. 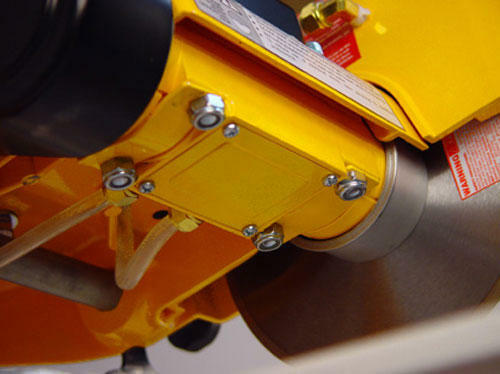 SawMaster has combined affordable pricing and high-quality products to set new standards in the diamond tool industry. 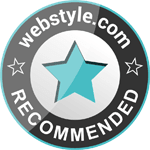 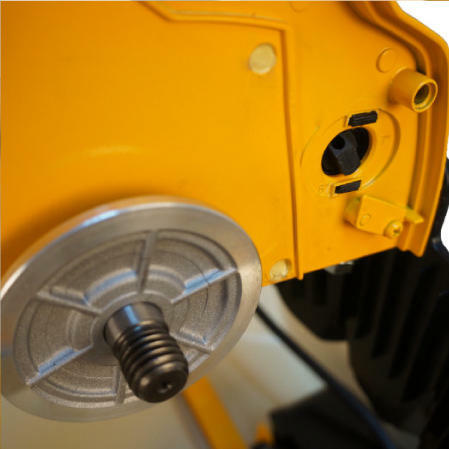 Our talented and experienced team of diamond tool experts will always provide our consumers with excellent customer service. 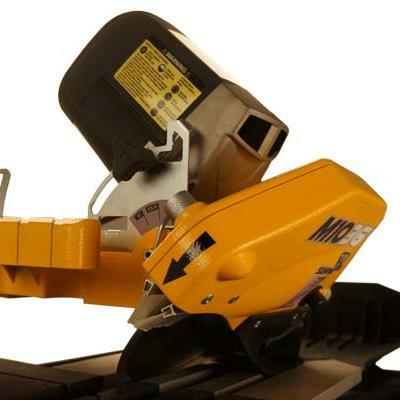 From tile saws, stone saws, masonry saws and much more, we are equipped with a wide variety of saw tools for all of your sawing necessities. 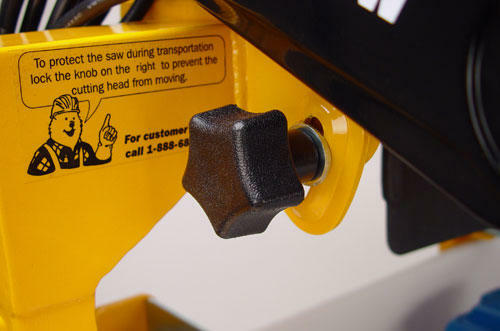 For further questions and concerns, please contact SawMaster today! The latest generation of the SDT-710 boasts several improvements over its predecessor. 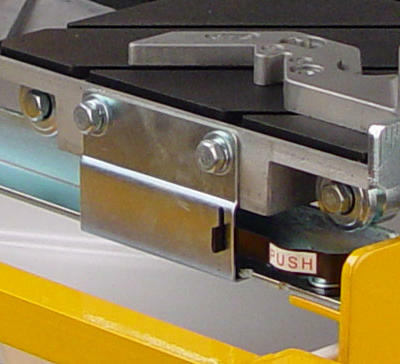 The saw's unique endoframe design yields significant weight savings due to its reliance on the surrounding water tray for support. 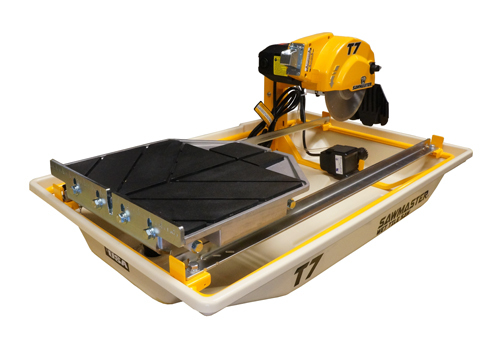 And with the introduction of more resilient polypropylene trays, the SDT-710 is able to achieve a greater level of durability, which lends additional support for the upgraded 1 HP motor. 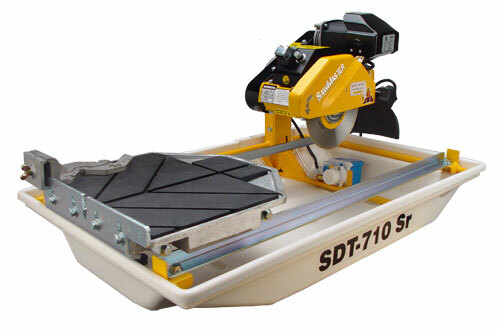 Diagonal Cutting 12" x 12"
Combining high performance, increased cutting capacity and improved durability, the SDT-710SR is the de facto standard of the SDT-710 series. 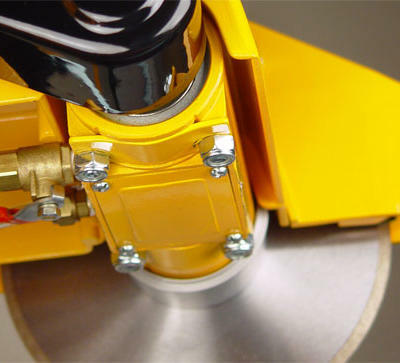 Driving the 7" blade is a patented 1 HP carbon brush motor which delivers enough torque to handle virtually any tile job with relative ease. 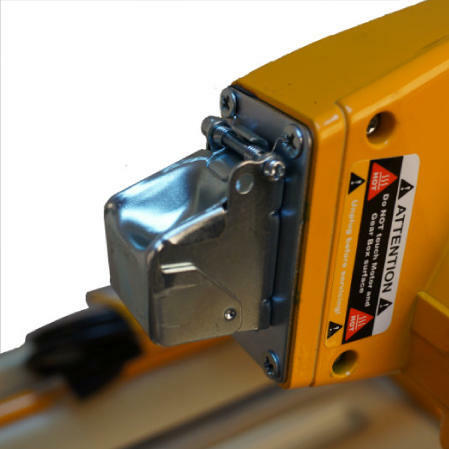 The power is complemented by a generous cutting capacity, that allows for cutting lengths of up to 20" straight and 14" diagonal. 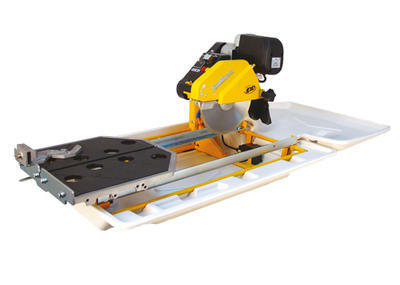 This unit is ideal for contractors in need of an affordable, portable wet tile saw, capable of performing on a par with heavy-duty saws but at a fraction of their weight. 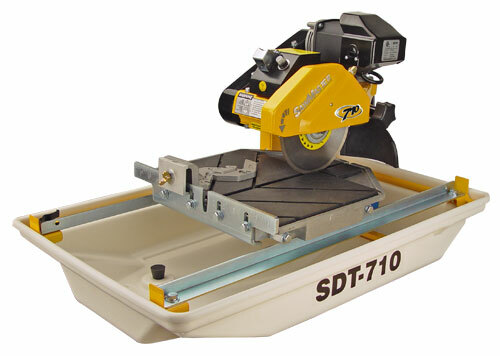 Diagonal Cutting 14" x 14"
The T7 is the successor to the portable 710 series saw. 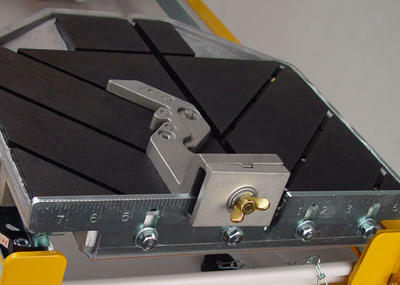 It retains the powerful yel lightweight design of the previous model, while adding some improvements. 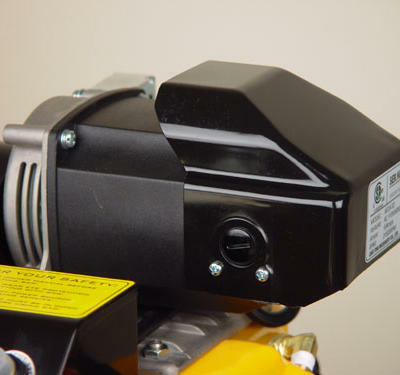 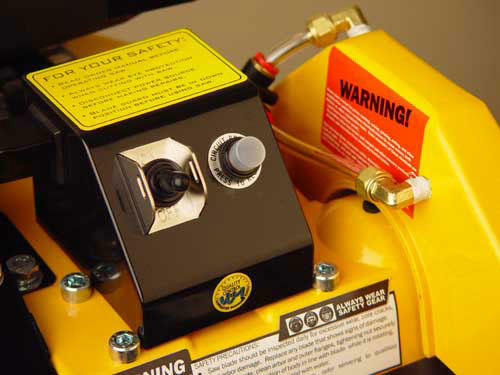 Power is now delivered from the powerful 1 HP brush motor via a gear system, instead of a belt assembly. 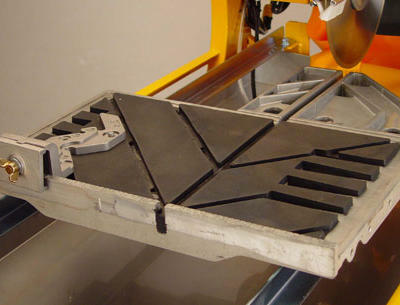 This in turn improves the saw's efficiency, which can be felt by the increase in torque while cutting. 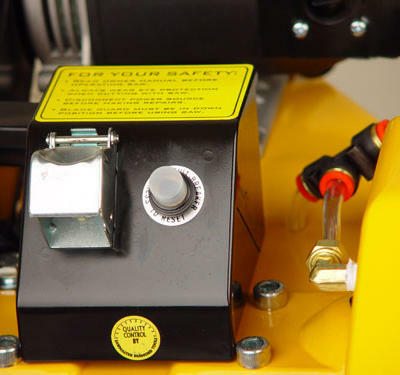 In addition the water delivery system and blade guard assembly has been changed to make the saw more user friendly, yet versatile. 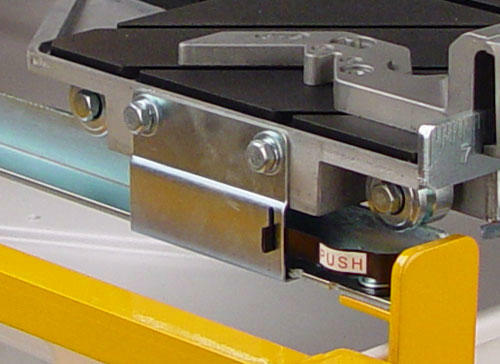 All of which are still mounted on the dependable all steel frame construction. The SDT-1010 is designed out to fulfill the need for a powerful, yet lightweight title saw capable of cutting large 24" tiles. 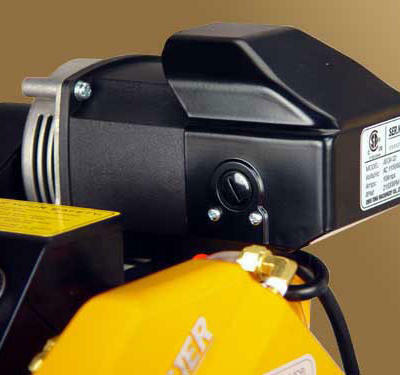 Its potenet 2 HP brush motor generates an immense amount of torque to enhance cutting performance. 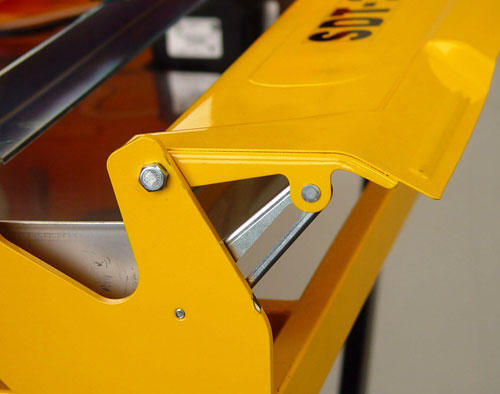 To minimite its weight, the saw relies on a highly durable yet lightweight BAS water tray for structure and support while retaining a rigid steel frame to provide the neccesary strength and stability. 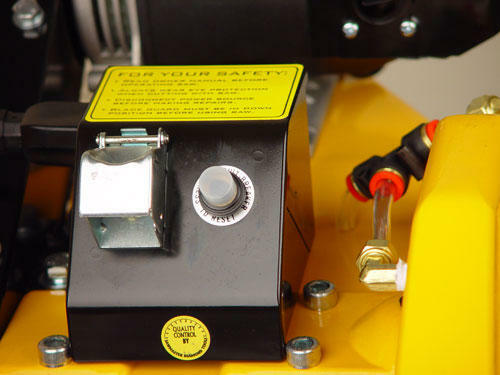 The E.D.I System is a revolutianary device that monitors the machine's performance and health and then provides feedback that will allow the user to work more efficiently as well as to quickly identify problems. 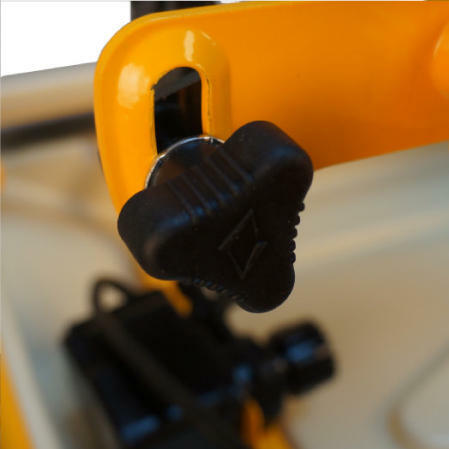 A built-in cluster of LED lights provide convenient lighting when working in poorly lit areas. 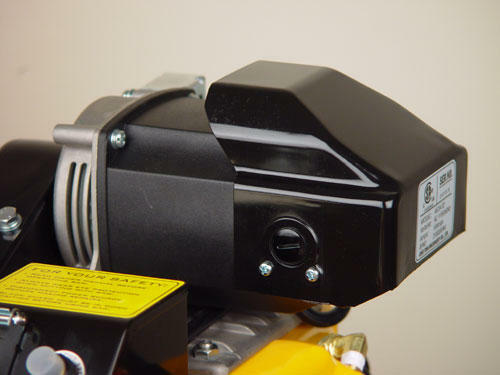 The equipped carbon brush motor generates a tremendous amount of torque, surpassing that of a comparably rated induction motor. 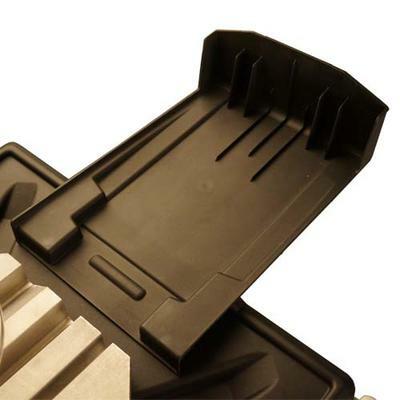 At the same time, it is also lighter and smaller, which makes it ideal for portability. 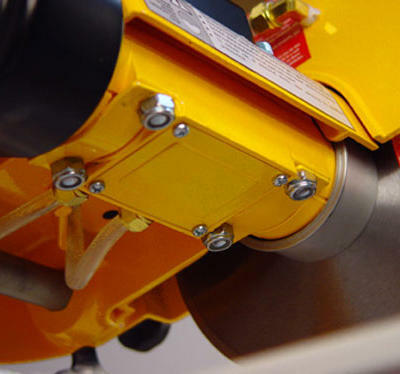 Water feed can be adjusted to direct water flow to the blade rim for improved cooling efficiency. 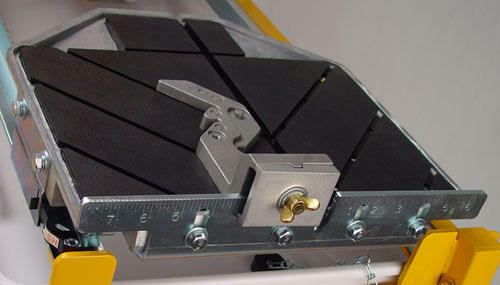 Drip tray returns water spray and runoff produced during operation to the water tray to minimize the loss of water and to keep the work site clean. 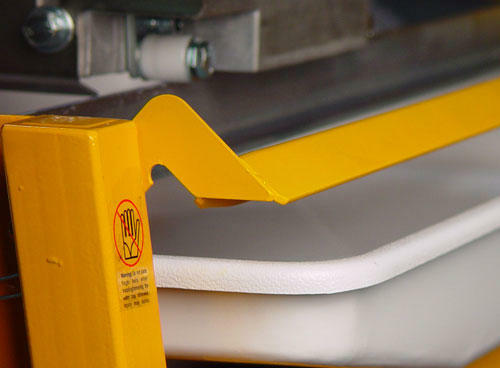 The provided ABS water tray is durable, yet lightweight, which helps minimize the saw's overall weight. 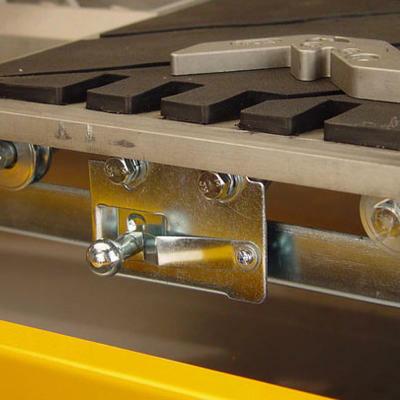 Revolutionary track system permits the cutting table to reach beyond the end of the track to achieve a longer cutting length without the added bulk or weight of a larger frame. 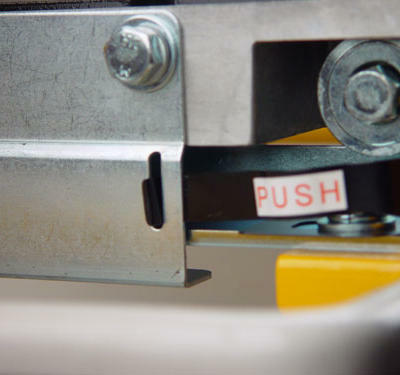 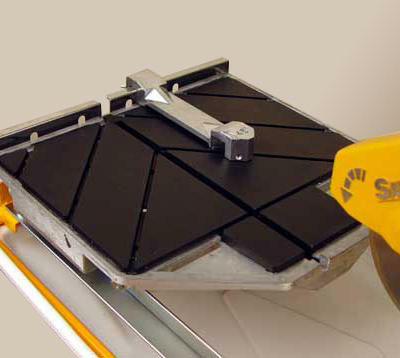 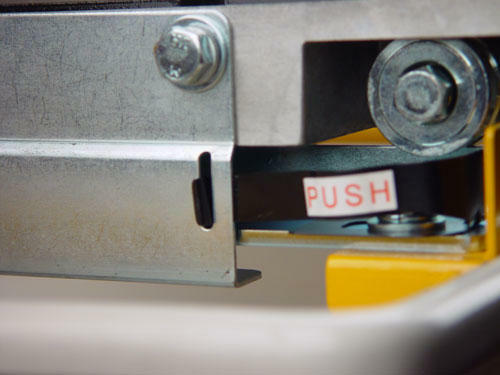 The cutting table features a convenient imprinted ruler on the rubber mat to assist the operator in making precise cuts. 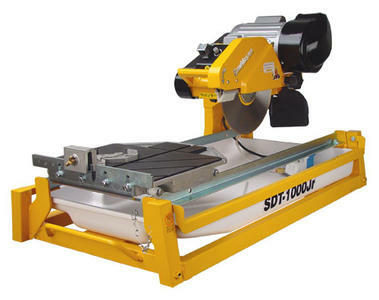 The SDT-1000Jr wet tile saw features a robust 1-1/2 HP induction motor capable of handling a broad range of applications, including thicker materials such as brick and paver. 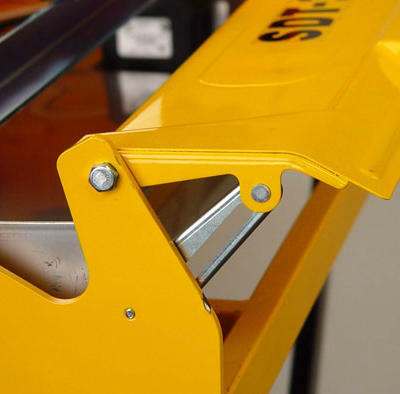 The saw is lighter than most saws in its class, weighing just shy of 100 lbs and priced for budget-minded professionals that are in the market for a 10" tile saw. 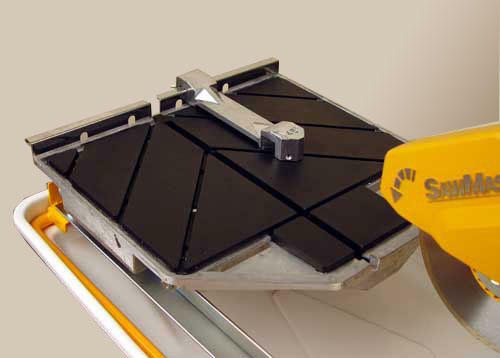 The SDT-1000XL is known among tile installers for its ability to deliver exceptional performance on tiles of all sizes. 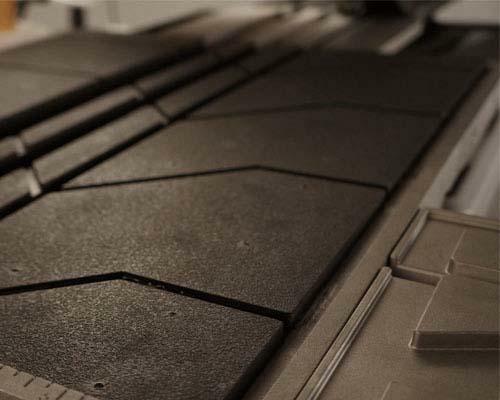 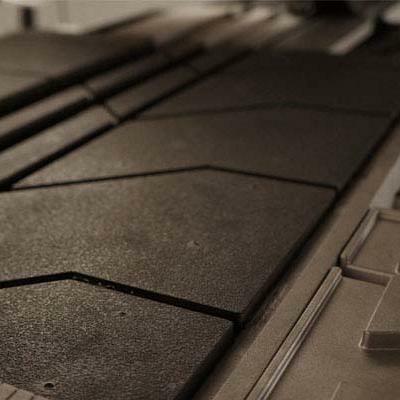 In fact, the SDT-1000XL was the first of its line to truly support oversized tiles—a significant feature by today's standards due to the common use of large tiles in modern construction. 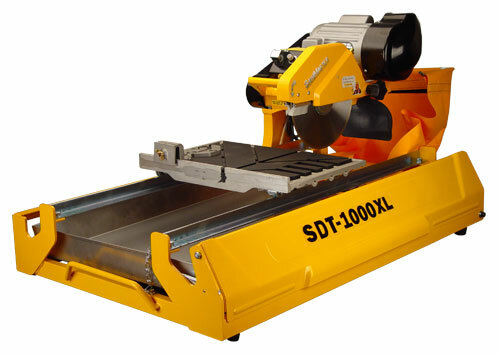 The latest generation of the SDT-1000XL continues to offer the same large cutting capacity and 1-1/2 HP motor of its predecessor. 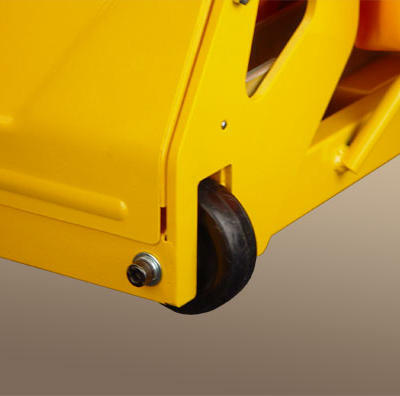 In addition, it addresses the issue of portability by including frame-mounted wheels to ease the task of transporting the saw around the job site. 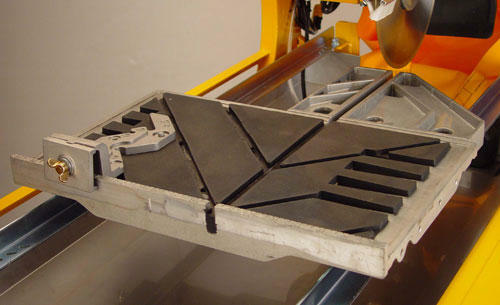 A versatile mobile wet tile saw. 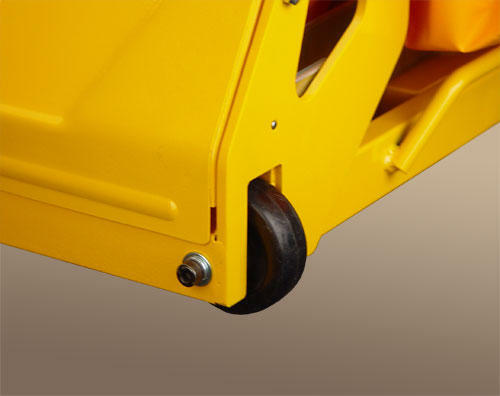 With its sturdy all metal frame and its convenient modular wheel system, this machine can handle anything the job site throws at it. 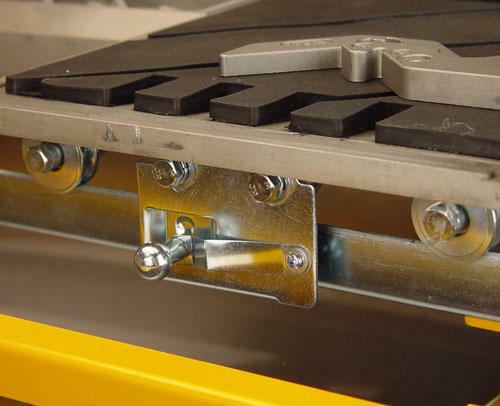 Having an all-aluminum cutting table with a rubber injected mat makes supporting tiles up to 36 inches very easy and secure. 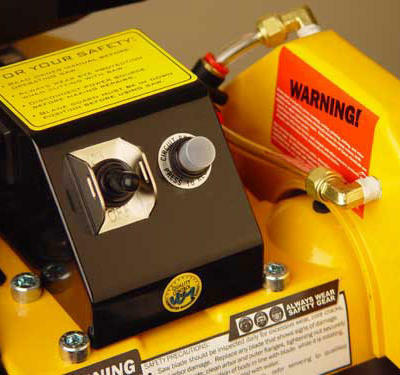 Powering the 10 inch blade is a reliable 2 horsepower universal motor, a motor that has proven itself capable of handling the most challenging materials. 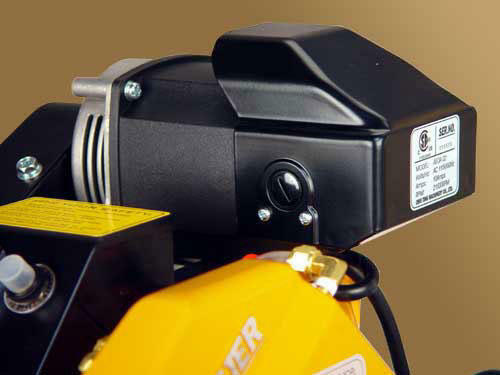 In addition the advance water filtration and spray system makes the saw a very attractive proposal to anyone looking for a very capable saw.